In 1981, Boyd Mefferd, then an internationally known sculptor specializing in large outdoor works, began restoring runabouts to provide variety in his work and to provide fill in projects between sculpture commissions. The antique boat hobby consisted of a small, but highly enthusiastic group, mainly amateur restorers, who were able to select their current project from a wide range of available craft. “Boyd’s Boatyard” evolved into a full service sales and restoration facility providing maintenance for hobbyists not interested in hands on involvement, and commissioned restorations for individuals who had a special boat needing work, often something with a long family history. Boat sales continued, featuring both restored and projects, with the inventory reflecting the ever decreasing availability of unrestored runabouts. 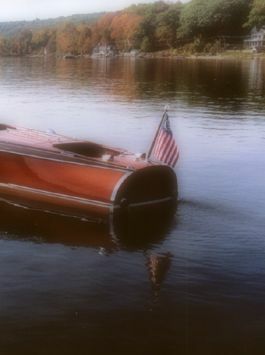 You will find no fiberglass boats in Canton, only wood, and because of a combination of philosophical and practical objections, Boyd has never traded in the recently manufactured reproductions runabouts.